Dark Horizon was sent to us for review by GamersGate. Thanks a lot! Dark Horizon is a 3D space combat game, similar in many ways to classics like Wing Commander or Freespace. It is the prequel to Tarr Chronicles from last year (2007), and takes place at the beginning of the Second Era, when Tarr Chronicles also takes place. In Dark Horizon, you play as one of the Guardian pilots in a squadron who has a critical role in saving the universe from being overwhelmed by a mysterious dark power called Mirk. Guardians have been infested with Mirk, but are able to keep it under control, so they can help their human friends, as well as those of other races. Earth has already been sucked into the Mirk, and more and more of the universe is slowly dying. But there is one last hope - the Light Core. You must help make sure that this secret weapon has a chance to save what is left of the universe. The story is deep and complex. There are several different races, as well as factions, regions, and information on Mirk and the Anti-Element. There is more, a lot more. There is literally hours worth of back story and encyclopedic content if you want to read it. Being a creature of the Mirk, your dreams are also monitored, as well as a form of dream interpreter or commentary for your perusal. These are all there for back story and development of how you understand your character. It\'s interesting, but definitely odd and somewhat boring reading at times. It\'s all completely optional, and very easy to skip past, and not critical to the game at all, though some of the conversations that you hear may not make as much sense if you don\'t read up. I read part of it, and I found myself a bit lost on the whole thing, and understood only part of what was going on during some of the story driven scenes during a combat mission. Nevertheless, it is interesting, and those who take the time to read more of it will likely find it more rewarding. Given the complex storyline, you may be surprised to find that the action itself is pretty straight forward. You ready, aim, and fire with energy weapons, turrets, or missiles, and shoot your way through wave after wave of enemies, with your goal being to kill said enemies, or to defend a friendly ship. Once or twice you also get to take part in wiping out a capital ship, where you get to destroy shield generators and turrets on your way to destroying it. There can be several objectives in a mission, and it\'s fairly straight forward in telling you what you need to do next. The one tricky factor is that if you get too far away from your squad leader, you are given a very short amount of time to turn around and head back. If you don\'t, you automatically fail the mission. That proved fairly annoying more than once. There are six acts, broken down into twenty two missions. Each act is played contiguously, except for a cut scene between missions, and thankfully an autosave. Unfortunately, there is no way to save on your own (except with a cheat code; but that doesn\'t save your progress, only your kill score). Between acts, you can examine your dreams, read an interpretation, read about the various races or other pieces of background information, watch a video on your next mission, or go the Hanger desk. The Hangar deck is where things get interesting. There is an incredible amount of customization available. You can select a Hull, Armor, Reactor, Shields, as well as Guns, Missiles, and up to two different miscellaneous devices. Not only do you get more things to work with after each mission, but you can actually disassemble parts and make new custom parts with them. There is an incredible amount of customization here for your ship. It\'s really fun to make the perfect ship, and the damage you can do later on is a lot of fun. While the action is not terribly complex, there is one interesting level of management, and that is heat. Each weapon fire or engine burn (like an afterburner) creates heat in your ship. You can quickly and simply remove this heat by pressing the \'J\' key which activates your coolant. If you want to, you can also increase your temperature by pressing \'L\'. When your temperature gets too high, your ship enters Corter mode. While in this mode, your weapons fire twice as fast, and your shields constantly drain. The outside part of your HUD (Heads Up Display) becomes red, to make it clear what\'s happening. The strategic use of Corter mode can really help a lot, as enemies can we wiped out much faster, but you have to be very careful. It\'s best with a lower number of enemies, or when the remaining are focusing on your allies. If you activate your coolant, you return to normal. If you continue to inject coolant, you will enter Shadow mode. This is a very useful mode where your ship recharges shields quickly, and fires very slowly, but in almost all cases, becomes invisible to radar. This is great if you are trying to run away and badly need a recharge, and it\'s also needed in a few of the game\'s missions. You can also order your wingmen, though I haven\'t noticed a dramatic difference in their behavior. The controls with which you move your ship are.. not bad if you like the mouse. There is a fair amount of customization available, and you can use the keyboard, mouse, and a joystick, or any combination of those you feel comfortable with. Unfortunately, as of the second patch, there is still no proper joystick support. There is support, but it only supports up to four buttons in a pre-defined configuration, and three axis, not including the fourth axis for barrel rolls. And, there is no way to assign buttons to custom actions. In my opinion, this is a missed opportunity. Joystick support is pretty important to a lot of gamers for games of this genre. It is promised in a patch, fortunately. We\'ll have to wait and see. After my initial shock wore off, I found that mouse controls are remarkably responsive, though not nearly as immersive as with the joystick I am used to for space combat games. I am looking forward to proper support in the future. In the meantime, you may be able to use JoyToKey or similar programs to get the joystick going for the impatient among us, though I have not tried this personally. The graphics, while somewhat dark at times, are quite pretty. 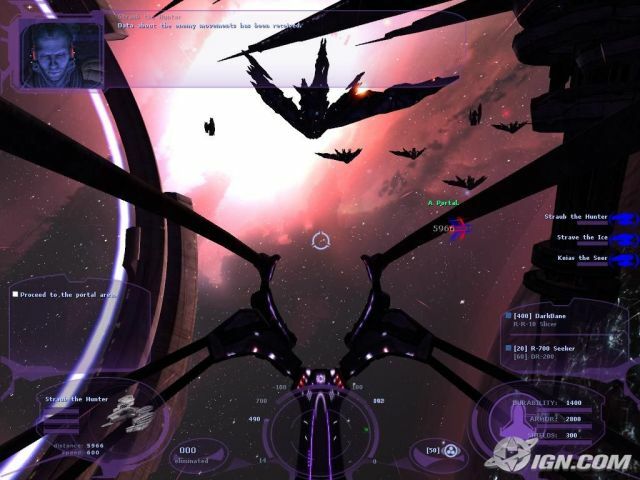 I wouldn\'t say they are the prettiest space combat game I\'ve played, but it\'s definitely not bad at all. My biggest complaint is that from a distance, it can be hard to see the enemy since they are so dark on a black background. You do eventually get used to it, but it\'s worth a note. I found the music and sounds to be good enough. The weapon fire is good, and the background music didn\'t bother me when played, though it was a bit repetitive at times. The AI is.. not so smart. The enemies have a tendency to ram into you without much concern for themselves, though this does seem to kill you faster than them, at least in the early stages. Your wingmen rarely contribute too much as the going gets tougher. Early on they do seem to help, though. Just be careful if you have an enemy right in your sights – it\'s probably going to ram you, and it can be difficult at times to avoid. With all that Dark Horizon has going for it, there is one glaring problem – bugs. Lots of bugs. One after another, in my experience. There are several missions with broken objectives where the result is crashing to desktop. There are cases where saves can become corrupted near the end of the game. I have had to skip missions with a cheat code at least a couple of times. There is also an incredibly annoying bug where I found my ship permanently stuck in Shadow mode, which I could trigger from time to time. This made for a really boring game as long as it was active. Completing a mission, or even an act, would not make this go away. You have to load an old save to get rid of it. I also found a bug where you can fairly easily, with stock parts, create an invincible ship. I really could go on. It\'s incredibly frustrating when an otherwise decent games is marred so much with problems. One thing I did discover is that in Vista, or at least the x64 version I run, keyboard input can quickly and easily get \'behind\'. This leads to keyboard keystrokes not responding when you press them, but sometimes a few seconds later. This also led to the Shadow mode bug a lot more often. Windows XP does not suffer from the keystrokes problem, which made that OS a lot better for Dark Horizon. Unfortunately, the Shadow mode bug was not completely gone in XP, though it did happen a lot less often. Nevertheless, I think you get the point. An otherwise fun space romp is marred with nearly game breaking bugs. If there is any good news from this, it\'s that the developers themselves watch their web forum, and are actively trying to fix the bugs. When I reported the invincible configuration bug, they thanked me and said they would fix that in a future patch. From a Christian perspective, there is not a whole lot unexpected from a space combat game. There are a few minor curse words, such as b*stard and the like. There is reference to the somewhat metaphysical Mirk, with some admiring as well as being afraid of it. Naturally, there is killing, though what you are killing is in some cases re-animated dead by the Mirk itself. The storyline is taken rather seriously by the characters, and the voice actors who play them. I did not notice much humor. Dark Horizon is a game that could be decent, but is kept short from being successful in this space combat starved market by a wide array of bugs, which really is too bad. There is no multiplayer, so the replay value mostly lies in whether or not you like to try a game again at a different difficulty or other similar challenge. My suggestion is to visit their website, check out their forums, and take a look around if you are really interested. It\'s too bad, as it might be a fairly decent introduction to the genre otherwise. It might be worth picking up if the patched keep rolling out. Only time will tell.